Since a little over 20 years ago, holding debates between candidates has become common in the Mexican political environment. Naturally, the first efforts were made during presidential campaigns. In fact, the first presidential debate was held during the 1994 elections. However, from that moment on, gubernatorial debates have been also increasingly common. The first public and broadcasted debate of this type was in 1997, during the first campaign to elect the Mayor of Mexico City. Debates have been driven either by electoral authorities or by media outlets. In this context, during the campaigns that today come to an end, there have been debates among the candidates for most of the 2015 gubernatorial elections. Nuevo León, one of the most important states whose gubernatorial election became more competitive as campaigns advances, had 5 debates. One organized by electoral authorities, one more organized by the Civic Council Citizen through its platform Nuevo León ¿Cómo Vamos? two organized by universities (the University of Monterrey and Universidad Regiomontana) and the other one organized by El Norte, a leading newspaper from Grupo Reforma. Some have been summoned all candidates and in others only the pointers in the polls. In all debates, each of the candidates has established his or her priorities and government plans in case of winning. The most recurrent themes were corruption and transparency, security, urban planning, and social and economic development. As a symbol of a closed competition, the meetings have not been free of attacks and insults among candidates. In Michoacán, electoral authorities organized two debates. All the candidates were invited. Given the latest developments in the state, it was no surprise that much of the discussion centered on proposals and recriminations on the subject of security. In Guerrero, state electoral authorities hosted a debate among all candidates for the governorship. As in the case of Michoacán, security was a recurring issue in all of the speeches and proposals. The candidates also addressed issues of poverty, tourism, public health, and social development. Other entities such as Sonora, Querétaro, San Luis Potosí, Baja California Sur, and Campeche also carried out one or two debates among candidates. In most states, there were other spaces where candidates contrast their proposals. Undoubtedly, the debates are important to the electorate, as they are spaces in which the contrast of ideas and positions is clearer than in speeches and/or political rallies. Of course, these kind of democratic exercises also serve to discredit and attack the opponents, which is also a good sign of democracy, as the political act is not without the clash of ideas. It is positive that debates in Mexico are becoming more common and that the both citizens and the media see these spaces as the right place to bounce ideas among the various candidates. Hopefully, these exercises will also help to increase citizen participation in the elections next Sunday. According to a study requested by the National Electoral Institute (INE), only 47% of Mexicans know the correct date of the legislative elections, a figure that rises to 51% in states where there is also a gubernatorial election. Furthermore, only 38% of voters intend to vote on Election Day, although some of them indicated that they will either spoil the ballot or leave it blank. That number increases to 45% in states with gubernatorial elections. These figures are in line with historical data in Mexico. According to the Institute for Democracy and Electoral Assistance, voter turnout in the legislative elections in Mexico was 44.61% in 2009, 41.68% in 2003, and 57.69% in 1997. These numbers are lower in comparison with the turnout for legislative elections when there are also Presidential elections. For example in 2012, the turnout was 62.45%, and in 2006, it was 58.60%. According to a study by BGC, 80% of voters believe that the campaigns are concentrating more on criticizing opponents than spreading proposals. According to their study, the most effective campaigns have been those of the PAN and the PVEM (Green Party), followed by the PRI. In the case of the PAN, their criticism of government corruption and their promises of improving security are the two most remembered issues. For the Greens, voters acknowledge that the party has already fulfilled some proposals related to health and security; in the case of the PRI, both criticism of PAN corruption and other benefits of the reforms already approved during this administration are recognized by voters. An example of this last situation is the gubernatorial race for the northern state of Sonora, which has recently received attention for other reasons. 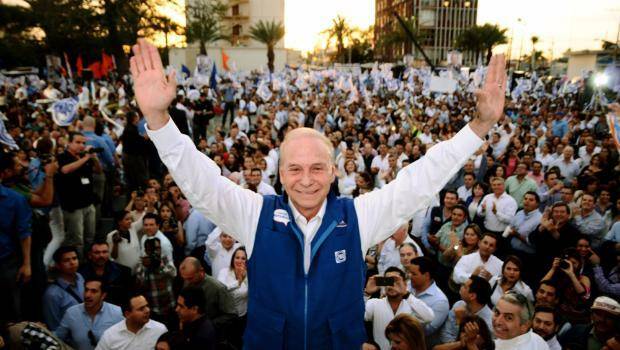 The leading candidates of both the PRI and the PAN have been involved in headline-making scandals on the front pages of the major national newspapers. For the PRI, the candidate was accused of improperly benefiting contractors in federal biddings and then was also accused of misusing a foreign-registered aircraft during the campaign. In the case of the PAN, the candidate has been accused of paying for the use of a plane owned by his wife with campaign contributions and was also accused of receiving a multi-million tax-amnesty by the state government. These recent revelations highlight the heated level of the political battle in Mexico and highlight the fact that it has become key to disqualify the opponent. Furthermore, the events in Sonora are surprising since those accusations and the evidence around them are not gathered easily. In conclusion, these elections have very clear issues to face, such as security in some states, social unrest derived from the missing students, and corruption scandals at all levels of government. However, if these ingredients are coupled with the fact that political participation is generally lower in midterm elections, then it is clear that the challenge of attracting voters is enormous. In this context, is uncertain if political communication strategies chosen by the parties during these campaigns will encourage voter turnout, or in fact could have the opposite effect, lowering participation. César Camacho, from the PRI, was in Nuevo León, where the state governor will be elected. During the rally, he said that the left tolerated and brought to power criminals, while the right has been inconsistent and ineffective over the past 12 years. With those arguments, he emphasized, the PRI will win these elections. Gustavo Madero, from the PAN, was in Michoacán, where he said that Guerrero and Michoacán, both states where a new governor will be elected, are “hot spots” because of the institutional weaknesses that they present. Madero was also in Querétaro, a state which he declared is a high priority for his party. Carlos Navarrete, from the PRD, was also in Michoacán, where he said that his party will focus on pulling Michoacán out from the “night” it has been in lately. At the same time, he emphasized that the security conditions ahead of the elections should be assessed by the Minister of the Interior, the parties, and the candidates in at least 4 states: Tamaulipas, Estado de México, Michoacán, and Guerrero. Martí Batres, from MORENA, said that the only useful vote is for his political party, as the other political forces are all the same. He was at a rally for a federal deputy candidate in the Estado de México. To read more about the challenges facing the political parties, see the conversations and events that we had with national leaders of the PRI, PAN, and PRD. For days, the National Electoral Institute (INE) has been engaged in a public debate with the teachers’ union in Guerrero (CETEG). The union has indicated that the only way they will let the elections happen is if the 43 students from Ayotzinapa appear alive. Under this condition, the CETEG has been pressuring authorities through blockades and protests, including the detention of officials. CETEG leaders have emphasized that an important portion of the polling stations have to be installed in schools, threatening to impede it. On the other side, the INE and local authorities have indicated that the way teachers are conducting the negotiation is not correct and that they will not tolerate violations and acts intending to derail the legal implementation of this electoral process. In the same vein, the interim governor of Guerrero has said that the main task of all the authorities is to guarantee that the elections occur. It remains to be seen whether the CETEG continue their protests mainly against local and federal authorities or whether they attempt to intervene in the political campaigns themselves. Also, it will be important to see how the candidates, parties, and authorities will discuss the delicate and sad topic of the 43 students from Ayotzinapa, which has shaken the credibility of the entire political system in Guerrero and has had a profound impact on politics nationwide.